I honestly think that 50% of the hype around Valentine’s Day is based on the fact that we all need a little pick-me-up, a little reminder of love, a little sparkle, this time of year. Not only are there now several weeks between us and the holidays – a sad realization that yes, we’re back to the grind for another year – but for many of us, we’re also at least ankle-deep in snow, slush, and the brown-gray dreariness of winter. Just earlier today, I looked out our living room window and gazed upon the street and sidewalks of Minneapolis and compared it to what I can only imagine 19th century city life was like in, say, London – sooty, muddy, messy. I’ve been watching a lot of BBC period dramas lately, guys. At any rate, with the news that Valentine’s Day is a mere four weeks away, it’s time to start thinking about what you might surprise your great loves with. Flowers and chocolates are all well and good, but something a little bit more personal, maybe even a little glam, is just the thing to turn someone’s February frown upside down. Starting today, I’m releasing three gift guides over the next week to help you navigate the holiday with ease. Each infographic offers fool-proof gifts, across a variety of budgets, for your main squeeze, your bestie, and anyone else whose very presence in your life you want to celebrate. After all, while sold to us as a day for romantic loves, shouldn’t Valentine’s Day really be about telling anyone with permanent residence in your heart how much you adore them? My third infographic later this week will even feature the very best DIY Valentine’s Day gift ideas in a show of solidarity with those that believe the holiday should be detached from consumerism. 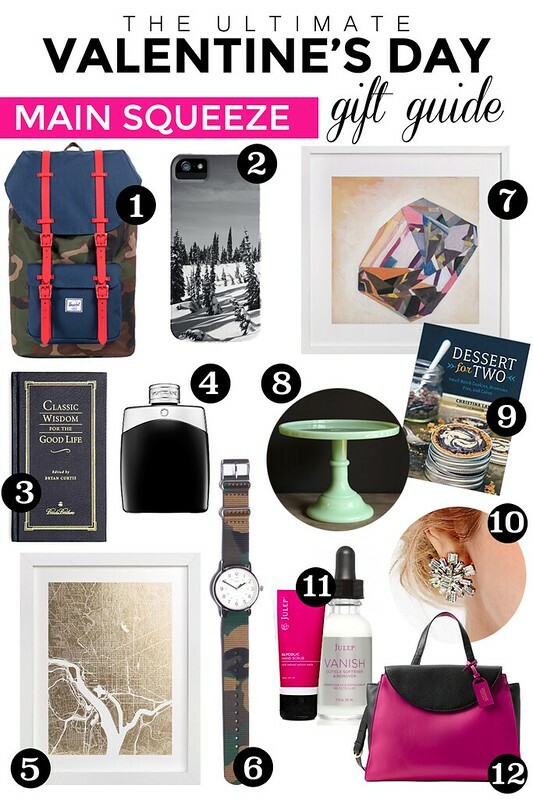 In the meantime, though, how about these gift ideas for your main squeeze? How excited would your sweetie be to open that gorgeous foil-stamped map print from Minted (the prism print and the cake plate are from there too – they have such beautiful gift ideas, let alone stationery!)? Or to crack into Christina Lane’s new cookbook featuring small-batch sweets for you and yours; her blog, Dessert for Two, is such a happy, inspiring, and tasty place to visit online. Bear stands by the Timex Weekender watch as a great gift that keeps on ticking – a present from Mom & Dad this past Christmas – and I don’t even bother giving myself a manicure anymore without using the hand scrub and cuticle remover from Julep. They truly improve the lifespan of my nail color and the neatness of the application – special thanks to my friend, Charlotte, for gifting me that duo last summer! Of course, for the purse-carrier in your life, is there anything more gorgeous than that Kate Spade Saturday A Satchel? It’s even on sale right now, though it remains pricey. That fuchsia leather though…droooooling. Got any great gift ideas I’ve missed? Let me know what you’re eyeing up for Valentine’s Day 2015 – whether for yourself or a loved one! Up next: Valentine’s Day gift ideas for your best friends! Stay tuned!